On this page you will find the 'Hints and Tips' leaflets from LBHF, WCC and RBKC. You will also find the secondary transfer brochure to help you decide on the best secondary school for your child. 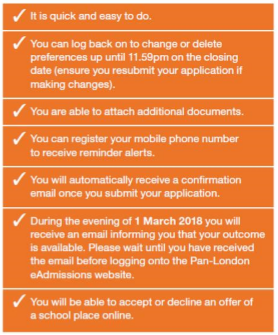 The closing date for on time applications WEDNESDAY 31st OCTOBER 2018 at 23:59.